Here's a financial tip no one gives you. If you owe money to the banks, make sure the amount is huge. Then you won't need to worry about paying it back on time. Or, indeed, in some cases, paying it back at all. This is not a joke. Several top business houses in India owe banks astronomical amounts and have defaulted in repayment. But instead of facing pressure to pay back these loans, companies are routinely given sweet deals: either their loans are 'restructured' in a way that allows a moratorium on interest payments, or their repayment schedule is extended generously. In December 2015, the Supreme Court ruled that under RTI, and in the interest of transparency, banks must reveal the names of companies who default. Until now, banks have refused to share this information easily. 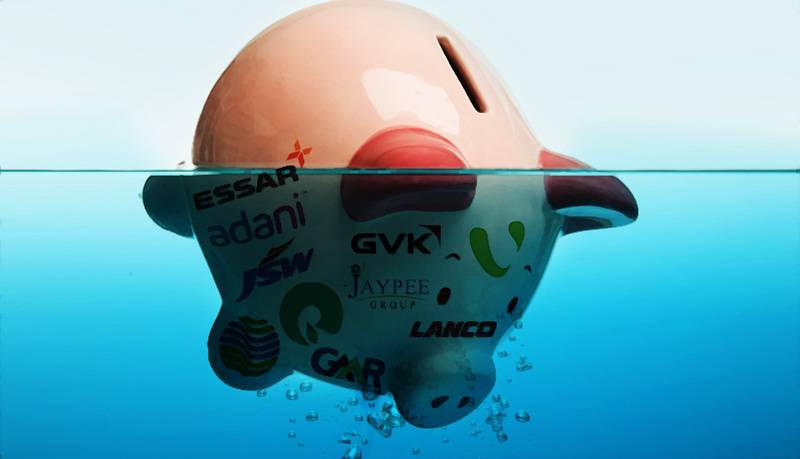 In absolute terms, the gross non-performing assets - loans not repaid by borrowers - owed just to state-owned banks was reported at Rs 3.04 lakh crore. That's four times the entire budget for education in India. A large part of these loans will never be repaid by the companies. Compare this with the farm loan waiver of Rs 70,000 crore given by the government in 2009 that faced huge criticism from free market economists who start beating their chests at the mention of subsidy to the poor in the country. The Reserve Bank of India so far has not released the details of individual borrowers who have defaulted on repayment of their loans. In the absence of this, here is a list of the 10 most indebted companies of India, reported by Credit Suisse in its October 2015 report. The debt shown on their balance sheets was till March 2015. One expects that debt on these 10 companies comprise a major chunk of the non-performing assets of the banks. Though it is unclear how much is the exact amount of non-performing assets against each company, however, just their outstandings make for staggering reading. The Anil Ambani-led Reliance Group is in the business of power, insurance, wealth management, telecommunication infrastructure and entertainment. In March 2015, the company had a debt of Rs 1.25 lakh crore on its balance sheet. The amount is equivalent to the special package announced for Bihar by Prime Minister Narendra Modi ahead of state elections in August this year. Anil Agarwal's company is the second-most indebted company. According to Credit Suisse, the company, which is into metals and mining, had a debt of Rs 1.03 lakh crore. This is equivalent to the amount raised by the Government of India in March 2015 through its biggest-ever auction of telecom spectrum. Managed by the Ruia Brothers (Shashi Ruia and Ravi Ruia) the company, with operations in 25 countries, owes Rs 1.01 lakh crore. That's what the Centre plans to spend on building smart cities until 2020. Gautam Adani, the chairman of the Adani Group of companies is known for his proximity with Prime Minister Narendra Modi. His business house owes Rs 96,031 crore to the banking system. The amount is a little less than the Budget for building the bullet train network between Mumbai and Ahmadabad proposed by the government. Earlier this year, the State Bank of India reportedly approved a loan of around $1 billion (Rs 6,600 crore ) for the company's coal mine in Australia. However, after much hue and cry in the media due to the highly stressed balance sheet of the public sector bank, the approval was withdrawn. Also read - Declining exports, few jobs, falling rupee: Is this 7.5% growth, Mr Jaitley? Manoj Gaur-run Jaypee Group has a debt of Rs 75,163 crore on its balance sheet. Jaypee Group had a golden time during the Mayawati rule in Uttar Pradesh between 2007 and 2012. The debt is eight times the allocation for mid-day meals in 2015 that feeds 12 crore school going children in the country. Sajjan Jindal is the chairman of JSW group and he was recently in headlines for reportedly organising the meeting between Pakistan Prime minister Nawaaz Sharif and Narendra Modi. Big connections allow you big credit lines. As per the Credit Suisse report, the group has a debt of Rs 58,171 crore. The amount is equivalent to the cost of 26 Rafale fighter aircrafts that India plans to buy from France. Named after its promoter GM Rao, the group is known for building Delhi's T3 International Airport terminal. The group has a debt of Rs 47,976 crore on its balance sheet. The amount can be used to build to coal-based power plants with a generation capacity of 4,000 MW each - enough to provide electricity to the state of Haryana during peak summers. Headed By L Madhusudan Rao, the company runs solar and thermal power plants. It has a debt of Rs 47,102 crore. Venugopal Dhoot's company, the group once famous for making televisions, owes Rs 45,405 crore to banks. This amount can be used to 93 missions to Mars by India. Founded by GVK Reddy, the group has interests in energy, infrastructure and hospitality sectors. The company has a debt of Rs 33,933 crore. The amount is just a little less than government's allocation under the MNREGA scheme (National Rural Employment Guarantee Act) of Rs 34,000 crore in 2015.